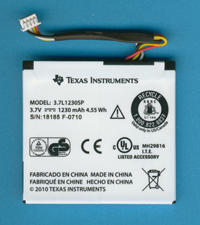 Size: 1.9" x 2.1" x 0.20"
The TI-Nspire Rechargeable Battery offers an alternative to disposable alkaline batteries for the TI-Nspire with Touchpad. It is also used with the TI-Nspire CX handhelds and the TI-Nspire Lab Cradle. TI-Nspire Rechargeable Battery includes a wall charger.